- Contact EOE Group Inc. The SAMSUNG SCX-4300 is small, yet powerful. Despite its diminutive 16.00" x 14.25" x 9.10" dimensions, it cranks out 600 x 600 dpi documents at a rate of 19 ppm. It also has a monthly duty cycle of 10000 pages. 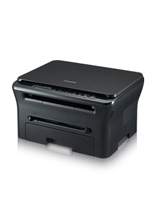 The SCX-4300 is versatile, too, with ID Card, Auto Fit, N-up, Clone and Poster copy modes. And a rich matte black finish gives a contemporary feel to your workplace. With the SAMSUNG SCX-4300, it's not hard to imagine. At a time when most technology like cell phones and notebooks are getting smaller, shouldn't your laser printer take up less space? Introducing SAMSUNG's SCX-4300, the smallest mono laser MFP. Now enjoy high-speed copying, scanning and printing right from your desk without sacrificing any space. This MFP is easy to place and easy to use. Combine all your needs into one compact package that prints, scans and copies but still fits right on your desk. This attractive multi-function printer sized at only 409 x 362 x 232 mm, takes up less space than most laser or inkjet printers. And you won't believe the speeds. With USB 2.0 connectivity, the printer prints 18 ppm in A4 and 19 ppm in letter. And the copying is just as fast; 18 copies per minute in A4, 19 copies per minute in letter. You will love the convenience of high-speed laser at home and at the office. SAMSUNG easy one-button features allow you to customise your printouts by using the printer instead of complicated software commands to get what you want when you print documents and photos. The ID Copy feature is SAMSUNG's exclusive function that allows copying of both sides of an ID card or other small document onto one sheet. Simply copy the front side, flip over the card, copy the back side, and print. You won't have any alignment problems or have to feed the paper back into the printer. The ID Copy feature is hassle free. Easily & quickly copy driver's licenses, insurance cards, or even pages from a passport. School IDs, insurance cards, whatever you need, you will be ready. SCX-4300 comes equipped with the Smart Panel programme that continuously monitors the status of the printer so that you don't need to The Smart Panel icon appears in the system tray if an error occurs. Double click on the Smart Panel icon to show the menu which includes : Toner Level, Buy Now, Troubleshooting Guide, Printer Setting and Driver Setting. SmarThru4™ document handling software will let you edit scanned images, save them in various formats, and set up copy/print formats - one click at a time.